I took this shot a few days ago. No photos today because I have had a whole day at home. That doesn't happen very often. At least I have caught up with housework. The crystal ball returns! Great way to put it to use! Gorgeous. I would like to invest in one of these crystal balls. Fab shot, at first I thought the boats were trees. Lovely crystal ball capture. One of these is on my wish list. Wonderful ! love the effect ! Nice/ Bet its great the right way up!! Breathtaking, Babs! Huge fav for me. Henny Penny the sky is falling!! Love your crystal shots. This is a nice one. I love Crystal ball photos. They are always so unique. I really need to get my crystal out sometime. I keep forgetting. LOL This is beautiful. Very effective Babs, beautiful clouds in the sphere! Love it! That is very cool looking! great colours in your crystal ball. Well done for getting the housework done. I would still have found distractions. Very pretty! I wish I could catch a sunset like this right now- one of our Scavenger Hunt prompts is "Having a Ball". How fun would a shot like this be! @stray_shooter @bella_ss @koalagardens @fbailey @carole_sandford @susie1205 @beryl @777margo @pcoulson @happysnaps @gilbertwood @louannwarren @mave @casablanca @merrelyn @cmp @henrir @mittens @thistle @seattlite @craftymeg @flowerfairyann @carolmw @happypat @snowy @pamdavis2015 @suzanne234 @kathiecb @julienne1 @bkbinthecity @ingrid01 @loweygrace @nicolecampbell @olivetreeann @hrs Thanks so much for putting this shot on the TP and the PP. @365projectorgjenfurj @littleconnie This is a 70 mm ball I bought on eBay $10 from China with free postage. @hermann Mine only works with photography too. doesn't predict the future ha ha. $10 from China so what can I expect, you get what you pay for. @inthecloud5 Can't help you to find your crystal ball with mine I'm afraid, it doesn't work with predictions. Only a cheap ball. I think you have to pay a lot more for it to work properly. Completely agree about housework, an endless (and thankless) task. 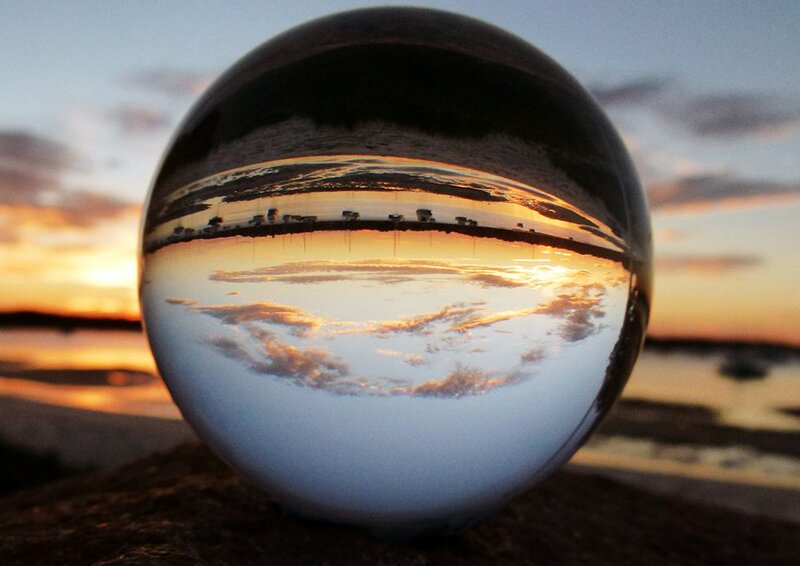 Fabulous crystal ball shot, totally excellent. @golftragic ha ha. Shall I vacuum the house or go out and take photos, no contest really is it! Beautiful sunset colours and capture. Amazing! Thanks for sharing with us. Stunning shot. Congratulations on the Top Twenty. Congratulations on this making the TT, so Deserving!